Our goal is to offer the customer the best quality ammunition at the lowest possible price. Out of an abundance of caution, we believe there may be some ammunition that was shipped which did not meet our exacting standards. It recently came to our attention that one lot of our 44 Mag 200 grain ammunition may not generate enough pressure to allow the projectile to exit the barrel when fired. Use of this product could result in firearms damage or personal injury. This lot was shipped between the dates of 06/27/2017 and 03/07/2018. If you have ammunition from Lot L170615037506-44 or L170615037506-52, please contact (208) 746-3668 to speak with one of our Customer Service representatives who will process your return and arrange the replacement of your product without any additional cost to you. To expedite this process, please have your order number ready. We would like to extend our apology for any inconvenience this may have caused you and we thank you for your partnership to help us improve. It is important to us that we provide you with the quality of ammunition that you expect when purchasing from Freedom Munitions. 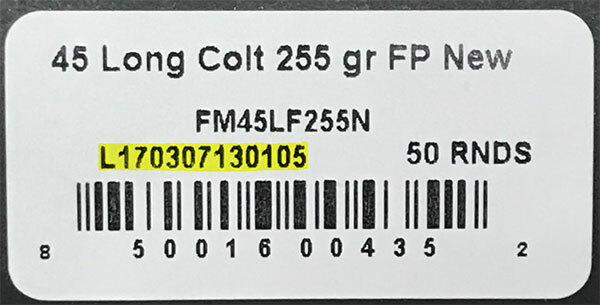 As a part of our ongoing evaluation process, we have found that some 45 Long Colt 255 grain FP New cartridges with lot number L170307130105 may not align with our quality standards. If you were shipped product between 3/10/2017 – 3/29/2017 we kindly request that you review the Lot Number on your product to determine if it is from the following production lot: L170307130105. If you have ammunition from Lot L170307130105, please contact (208) 746-3668 to speak with one of our Customer Service representatives who will process your return and arrange the replacement of your product without any additional cost to you. To expedite this process please have your order number ready. Please accept our apology for any inconvenience this may have caused and thank you for your partnership to help us improve. Our goal is to offer the customer the best quality ammunition at the lowest possible price. Out of an abundance of caution, we believe there may be some ammunition that was shipped which did not meet our exacting standards. In an effort to maintain these high standards, Freedom Munitions would like you to review your recent order of .223 Remington 55 grain FMJ Reman ammunition manufactured between 1/18/15 - 1/23/15 and 3/2/15. We believe that your order was shipped on or after one of these dates and may contain some ammunition that we feel is not up to our standard of quality. Please check your ammunition box for the following lot numbers marked in red. The lot number information is located on the white sticker on the end of each fifty (50) count box below the bar code. Freedom Munitions’ remanufacturing process produces high quality ammunition that compares to new. We purchase fired brass only from indoor ranges. After sorting by caliber, cases are checked for defects using Scharch Range Master case processing equipment. The Scharch processing machines automatically check for debris inside the case and pressure tests each case for splits or cracks. Next, the primers are removed, flash holes are cleared and the primer pocket is reamed to easily accept a new primer. After processing the cases are re-sized to SAAMI specifications, wet washed and dried. The processed cases are clean, shiny and ready for loading. We ask that you please call our customer service line at (208) 746-3668 or send an email to returns@hmtgroup.us confirming that you do OR do not have any of these lots of ammunition. We apologize for any inconvenience this may cause and look forward to hearing from you so we may answer any question you have. We greatly appreciate your help with this! If you do have any of these lot numbers, we ask that you call or email us with your full name, order number, contact number, and the number of rounds you have remaining from the lot. A pre-paid return shipping label will be emailed to you so this product can be returned to our factory for inspection, at our cost. We will provide replacement product to you immediately. Please contact us if you have any questions or need additional information.